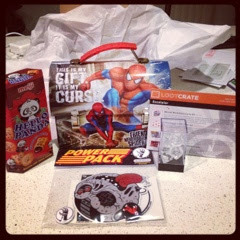 This month's LootCrate comes with a cool Marvel Workman's Lunchbox. There are a few different designs available. I got lucky and got my favorite superhero Spider-Man! Do you LootCrate? Sign up today! Just use the link below. I hope that title has gotten the song "Push it to the Limit" by Paul Engemann in your head right about now. If you don't remember that song, think of the montage scene in Scarface with all the money laundering, the wedding and the tiger. Ok, do you have the song in your head now? Good, let's go! Fandads has teamed up with A Blogger and a Father and a few other dad blogs to give all our readers a chance at winning a pair of Sol Republic Headphones. We figured this would be a great way to promote the giveaway on more than one site and hopefully introduce our readers to other great dad blogs that are out there.